Are you facing a challenge in your relationships, career or in reaching your dreams in life? It is probably not as big a challenge as becoming the president of the USA. Cheer up, read on…. More than 50% of millionaire entrepreneurs never finished college. These statics are from the book Talent Is Never Enough by John Maxwell, writer and speaker. Maxwell has become a famous name in the area of leadership training and is a prolific writer. He has written over 60 books that have sold over 19 million copies. You have probably read about people who started with nothing and accomplished great things in life. 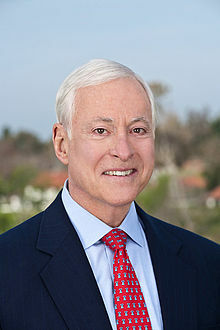 Brian Tracy (in photo) is an example of this; he was born into a poor family. He was not good in school and was not popular among his classmates. He failed a high school English class and didn’t show promise in any area. He became a laborer, drifting from job to job. Eventually he got into commission sales, getting paid only if he made sales. He sometimes slept in barns, in his car or beside his car. Later he began renting a room and had to scramble to make enough sales to pay his food and rent. He decided that he could become a better salesman if he learned about sales, so he began to read every book he could about it. Every month his sales increased until after a few years he became the top salesman in his company. He was promoted to sales manager and trained his salespeople the techniques that made him great at selling. After some time, the people working for him became better and better. Now Brian Tracy is a multimillionaire, having started many companies. [ Smiles ] I think that you would make a great motivational speaker. I truly enjoyed your article! Your daily affirmations are a great blessing and a reminder that we can do anything if we just do it. Thanks for taking the time to share these wonderful stories.